Pull ups are a great strength exercise. They condition the back, core and arms into amazing shape, and if you do enough of them, they’ll help develop that ever-desired “V” taper that makes men look broad, and women look small-waisted. So why isn’t everyone doing pull ups all day long? They’re hard, that’s why. That’s not to say that we shouldn’t do them, just because they are hard. But some of us may need to work up to a full-on strict pull up. Luckily there are some more modifiable exercises you can do that will strengthen your back, and help build your arms and core (and hands) to be able to hoist your weight up over the bar. Start incorporating these three exercises into your regimen a couple times a week, and you’ll be busting out pull ups in no time! This one is pretty obvious, since it basically mimics the motion of the pull up. What’s different, is that you’re going to do it standing up. Find a cable pulley machine and put the arms as far up as they’ll go. Make sure you’ve got one handle for each arm and choose a weight that will allow you to do 8-10 reps with your palms facing away from you. Stand under the handles with your knees bent and back in a natural arch. Squeeze your glutes to stabilize yourself and complete your reps with slow, controlled movements. Standing gives you the added benefit of engaging your core. Believe it or not, your core is a big part of a pull up, and training your arms and back will be pointless without the core training you need to stabilize your ascent. 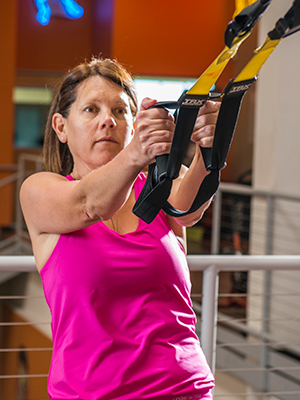 Find some TRX straps and with the straps at the shortest length, grip a handle in each hand. Bring them up to your chest, backing up until all the slack in the straps is taken up. Now extend your arms straight, dropping your body back, with your palms facing one another, until your arms are fully extended. Reverse the motion and pull your body back up so your hands are near your chest again, squeezing your shoulder blades together for a moment before repeating the motion. To increase the difficulty, scoot your feet forward. To decrease the difficulty, scoot your feet back. A common weak link in the pull up chain is the grip. A lot of people will lose strength in their hands before they will actually have to stop doing pull ups. Make sure that when you’re training your back and core, that you’re also training your hands to grip strong and long. A bent over barbell row is a great exercise to strengthen the entire back, and seriously challenge your grip to adapt and perform up to the new standards you’re demanding. Grab a barbell w/ some moderate weight on it. If you’re unfamiliar with proper positioning for your back, or question your strength, be safe and start on the lighter side until you are certain that your form is solid. Start with your palms down, gripping the bar where it naturally falls at mid-thigh level. Now slightly bend your knees, engage your glutes, straighten your shoulders and lean forward slightly, always maintaining the natural arch of your back. Squeezing your glutes really tight helps with this. Now pull the bar up to your belly button-ish level, pause for a moment, and then reverse the motion, controlling the return to your start position. Repeat this motion until you fatigue. Starting with a lighter weight will allow more reps, but eventually you should work with a weight that allows you to do no more than 8-10 reps before you need to put the weight down. Play with the grip on this one. Try a set with your palms up, and then one with your palms down. Try a wide grip, and then a narrow grip. Moving your hands around changes the angle of attack, and allows you to develop greater muscle recruitment from a broader range of areas. If you can’t waltz in the gym and bust out 25 pull ups today, don’t be sad. Anything worth doing (and pull ups definitely are) is worth fighting for, so start where you are, train hard, and you’ll reach your pull up goals in no time!